This Sunday, September 27, marks the beginning of the traditional celebration of mid-Autumn festival in China and Vietnam. It is a very ancient holiday, its observance stretching back to as early as 3600 years ago, and perhaps even earlier, and it is one of the most important holidays in Chinese culture. Great effort is usually made to travel and be with family on this day, much like Thanksgiving in the US, and for several days around the holiday many businesses and markets are closed as people make their way back to the places where they grew up, in order to celebrate with their extended families. The Chinese characters for this holiday are 中 秋 節 which is pronounced Zhong Qiu Jie in Mandarin and Jung Chau Jit in Cantonese, and which translates literally into "Mid-Autumn-Day" or "Middle-Fall-Holiday" (or even more literally the "Mid-Autumn-Node"). Jung Chau Jit is celebrated on the fifteenth day of the eighth lunar month, the fifteenth day corresponding in general to the full moon in a lunar month (because a lunar month commences with a new moon, and the moon waxes for fourteen days to become full, which happens on the fifteenth day, and then wanes for fourteen more days to the point of another new moon), and so this festival always falls very close to or directly upon the day of a full moon, as it does this year. These are traditionally served by being cut carefully into four equal quarters (a little combination cutting-and-serving implement, something like a small version of a cake trowel, is often included in commercially-sold mooncake boxes or packages), with each person present being given one section. The cakes themselves often have "blessing" words baked into the top of them. Being a Moon Festival, the holiday is also closely associated with the Moon Goddess, pictured at top, whose name is 嫦 娥 which is pronounced Chang Er in Mandarin and Seung Ngo in Cantonese and translates rather directly into "Chang the Beautiful" or "Seung the Beautiful." There is a legend about Seung Ngo and her husband, 后 羿 being banished from the heavenly realms by the Jade Emperor (whom we met in the earlier discussion of the Lantern Festival, which takes place in the first lunar month) and having to live down upon the earth as mortals (his name is pronounced Hou Yi in Mandarin and Hau Ngai in Cantonese, and it means something like "King Archer"). In the legend, he is distraught at the idea that his beautiful wife, having been banished from the celestial realms, is now faced with mortality, and so he seeks and eventually obtains an elixir of immortality which will restore their immortality to them. However, as so often happens in such myths, the plan goes awry, when she is forced to drink it all herself (either to keep it from a marauding robber who breaks in to steal it from her while her husband is away, or because she is overcome with curiosity while he is asleep, and drinks the whole elixir without knowing the consequences). As soon as she does, she feels herself floating up into the heavens, without her unfortunate husband, who is left behind as a mortal. The two are thus separated forever, but Seung Ngo settles on the Moon, where she can look down upon Hau Ngai, and he can gaze up to her new home and think of her. Having examined some of the most prominent aspects of this important ancient holy day, we are now in a position to benefit from the deep knowledge contained within its symbols and forms. Because this poignant myth, and all the other symbols of the Mid-Autumn Festival, are powerful symbols which speak to truths about our incarnate existence, this existence in which we find ourselves crossing the "underworld" of the material realm in a physical body -- which is closely associated with the figure of the moon in the ancient system of celestial metaphor -- but doing so with the dimly-remembered awareness that we are separated from our true home (and disconnected from our higher "divine twin") during this earthly sojourn, and that we are in fact actually spiritual beings as much or more than we are physical beings. The festival, positioned in the time of year next to fall equinox, contains the same symbols of a goddess and the fall from the celestial realm into the mortal incarnate life associated with the point of autumn equinox literally worldwide in the ancient myths. The presence of a goddess-figure (in this case, the goddess Seung Ngo, or Chang Er), goddess figures being shown in the previous post to be associated in ancient myth the world over with the point of fall equinox and the plunge into incarnation. A myth in which there is a prominent theme of expulsion from the heavenly realm and banishment to the earthly realm (the plunge into this lower realm), featuring a duo in which one of the pair is mortal and one divine: just as we, in this incarnate life, find ourselves "crossed" with a physical body and an internal divine spark. The incorporation of moon-themes to go along with the incarnation theme of the fall equinox (dominated by the presence of a goddess at the point of incarnation). As Alvin Boyd Kuhn demonstrates in extended discussions found in Lost Light, published in 1940, the ancient myths and sacred traditions very often used the moon to symbolize our incarnate form, and the sun our divine spirit, which lights up and animates our physical body in the same way that the sun gives its light to the moon (see pages 115 and following, for example, or 520 and following, or 139 and following, or 521 and following). In that exploration of ancient myth, Kuhn says quite explicitly: "The sun types soul, always, the moon, body" (479), and elsewhere: "The moon being the parent of the mortal body, lunar symbolism was prominently introduced into the portrayal "(140). The connection of the moon (our incarnate side) with the idea of water, seas, oceans, and incarnation (through the tides, and also through the internal tides of our body), which also connects with the goddess-ocean connection discussed in the previous post (with examples which demonstrated the "mother-ocean" connection inherent in the names of Mary, Tiamat, and Aphrodite, as well as in the Chinese ideograms for mother and ocean). The tradition of gathering together with family at the Moon Festival, representative of the idea that we align the cycle of our personal lives and our physical motions (often traveling great distances) with the cycles of the earth, sun, moon and stars: reinforcing the profound connection between "microcosm" and "macrocosm" discussed in the preceding post (and many others), a connection which the ancient myths and sacred traditions of the human race the world over all seek to convey. The tradition of gathering together with family at the Moon Festival, which also commemorates our physical, material entry into this incarnate life, which is celebrated when we honor our family and especially our parents. Traditions in this holiday (especially as celebrated in Vietnam) which focus on children and proclaim it to be a holiday which honors young children, who are just embarking upon their journey through the incarnate human life. The tradition that mooncakes are cut up into four quarters, which is clearly connected with the lunar symbology, but also with the concept of "crossing" or the crucifixion of this incarnate life (see numerous previous posts which demonstrate that the Great Cross of the year was associated in ancient myth with the twin components of incarnate human existence: the horizontal component representing the physical, "dead," "animal" nature of our body, and the vertical component representing the spiritual, divine, celestial component of the invisible and infinite realm which the ancient myths tell us is actually all around us and also within us and within every other being with whom we come into contact). Clearly, then, the Mid-Autumn Festival preserves a great many symbols which carry a profound spiritual message, using the symbology of the moon (associated with incarnation), the casting down from the spiritual realms into incarnate existence (in the story of Hou Yi and Chang Er, or Hau Ngai and Seung Ngo), the myth regarding a married couple who are extremely close but who find themselves in the condition of one divine and one mortal (the "divine twin" pattern found around the world, including in the myth of Castor and Pollux but also of Jesus and Thomas and many others), the traditions of gathering with family and ordering our lives in accordance with the cycles of earth, sun, moon and stars, and the traditions of honoring our physical family and our parents, who brought us into this incarnate body in the first place. ends up looking like the symbol for "the moon" when it functions as a radical in a compound character. That is a valid argument, but we must ask ourselves why that "meat" symbol turns into a "moon" symbol in all of these ideograms? The answer, of course, could very well be the fact that the ancient wisdom of the human race universally acknowledged an esoteric connection between the moon and the physical, corporeal, carnal ("meat") body. And so it becomes clear that all of the symbology of the culturally significant and anciently-established Mid-Autumn-Festival can be shown to be connected to other mythological symbols used in other myths around the world -- all of them designed to impart to us profound gnosis regarding our human condition here in this incarnate life, including the fact that we are not merely physical beings but that our human nature consists of both a physical and a spiritual component, that our physical "moon" form (associated with water) is illuminated by our spiritual "solar" and divine nature (associated with fire and with air -- or spirit). Now, very briefly, let us also note the fact that because the Mid-Autumn-Festival always falls on or very near a full moon, it will also periodically happen that this anciently-ordained observation will coincide with a lunar eclipse. Previous posts on the actual celestial mechanics of the moon phases (see here, here, and here) have explained why lunar eclipses must always coincide with a full moon, and why solar eclipses must always correspond to a new moon (not every full moon is a lunar eclipse, of course, nor every new moon a solar -- but every lunar eclipse occurs at full moon, and every solar eclipse occurs at new moon). This September 27 full moon also happens to take place when the moon is passing through a "lunar node" (a "crossing point" with the plane of the ecliptic of the earth) and will therefore result in a total lunar eclipse visible for most of the Americas, Africa and Europe (see resources from Sky & Telescope regarding this eclipse available here). Not only is this a total lunar eclipse, but it is also a total lunar eclipse which corresponds to the moon's closest approach on its orbit around the earth, when it is physically closer to us and thus appears physically larger in the sky -- all of which add up to the promise of a spectacular heavenly event this weekend. This particular moon (all month long) is in fact known universally as the Harvest Moon (in China also), which is traditionally understood to be the brightest moon of the year. All of these factors argue that this weekend's lunar eclipse should be worth going out and watching, if at all possible in your particular global location and circumstance. Joel 2:31 "The sun shall be turned into darkness, and the moon into blood, before the great and terrible day of the LORD come." Acts 2:20 "The sun shall be turned into darkness, and the moon into blood, before that great and notable day of the Lord come:"
Revelation 6:12 "And I beheld when he had opened the sixth seal, and, lo, there was a great earthquake; and the sun became black as sackcloth of hair, and the moon became as blood;"
Alvin Boyd Kuhn actually addresses many of these Biblical passages directly, and argues (with extensive textual evidence) that the description of the "moon becoming as blood" only emphasizes even more dramatically the esoteric symbolical connection between the moon and our physical body in this human life. along with the darkness over the earth, the veiled sun, the blood-stained moon, is that "the stars from the heavens fell." In the same place we read that "when the message of the third angel was sounded forth, a great star went down from heaven and it fell upon the earth." Another star fell at the sounding of the trumpet of the fifth angel. The various legends, then, of falling stars become invested with unexpected significance as being disguised allusions to the descent of the angelic myriads to our shores , -- to become our souls. 116. In other words, Kuhn here argues that the metaphors in Revelation 6 (and indeed throughout the Bible) all have to do with our incarnate condition, consisting of a "crossing" between spirit (symbolized by the sun) and matter (our material bodies, symbolized by the moon). It would include (according to Kuhn) the moon being bathed in blood -- because the moon represents our incarnate condition, our sojourn in a body composed of water and blood and clay, our crossing of the "Red Sea" (which can be metaphorically seen to be the crossing which each and every human being undertakes, going through life in a human body through which courses the "red sea" of the blood in our veins and arteries). It would include (according to Kuhn) the stars being cast out of heaven and forced to "fall upon the earth" -- for this is the very condition in which we find ourselves, as human souls who dimly realize that we come from a spiritual home, but who have been exiled (just like Hau Ngai and Seung Ngo) upon this material plane. In other words, the passages in Revelation (and all the other esoteric Biblical scriptures) are describing our own human experience, our experience as divine beings who have been "crossed with" physical, material, animal bodies during this incarnate life. And this is just what all the other Star Myths of the world are trying to convey to us as well! (Note that it can be conclusively demonstrated that the passages of the book of Revelation involving the opening of the seven seals are absolutely based upon metaphorical descriptions of the constellations in our night sky, as I demonstrate briefly in this previous post regarding Revelation Chapter 9: they are all allegorical celestial metaphors which use the awe-inspiring motions of the heavenly cycles to convey truths to us about the invisible realm). Indeed, all of these metaphors and sacred scriptures are designed to convey to us the very same truths conveyed through the ancient metaphors connected to the Mid-Autumn-Festival celebrated in China and Vietnam and some other surrounding cultures from time immemorial. As the day of the first full moon after fall equinox approaches, it is a time for contemplation and reflection upon our human condition in this incarnate life -- our "plunge into matter" which in ancient myth was associated with the point of the fall equinox, with the goddess at the edge of the ocean (or the goddess of the Moon), and with the "crossing" of our divine nature with a physical body. And yet, even as we are plunged into this physical human form, we are given forms and symbols and myths and stories and scriptures to remind us that this material world that is visible and perceptible to our senses is not all that there is, and that this physical "animal" human body we inhabit is not all that we are. Just as the moon is illuminated by the fire of the sun's life-giving rays, so our material nature is illuminated and animated by a higher spiritual self that exists "above and beyond" our merely physical carcass. Just like the mooncake in the Jung Chau Jit celebration, which is divided and quartered into four equal sections, we ourselves are made up of a "cross," a "crucifix," a "quartered whole" consisting of both a horizontal line (between the equinoxes, and associated with matter) and a vertical line (between the solstices, reaching towards infinity, and associated with all that is spiritual, and with raising the spiritual aspect within ourselves and with calling it forth in those we meet and indeed in all of creation around us). I sincerely wish you a very blessed Mid-Autumn Festival, and harmony between the microcosm and macrocosm. May all beings be freed from suffering and filled with peace and joy, love and light. image: NASA, Wikimedia commons (link). And so we return to the end of another moon, rapidly decreasing towards the point at which the sun will again overtake the moon and illuminate only the side of the moon facing towards the sun and away from the earth -- the new moon, arriving on the morning of September 24 (GMT -- or the evening of September 23 for those of us on the trailing edge of the North American continent, who cross into the "next day" behind most of the other parts of the globe). The moon is currently in its last quarter, waning into a thin crescent, and rising very late in the night (in the small hours of the morning, about 4am on Friday, then closer to 5am on Saturday as the sun inexorably overtakes the moon, as happens every month). For discussion of the mechanics of the sun's monthly overtaking of the moon, see this and this previous post. The late rising of the moon, and the fact that it is waning rapidly towards invisibility, makes these nights among the best for stargazing. Currently, the stars on brilliant display during the "prime time" hours of the night after nightfall and leading up to midnight include dazzling Sagittarius squarely in the south (for viewers in the northern hemisphere) at his highest point, with the Scorpion of Scorpio leaning steeply down towards the west, and the shining river of the Milky Way arcing straight up and overhead, in which fly the unmistakable forms of the Swan and the Eagle. All these constellations, as well as the Big and Little Dippers, Hercules, and the Herdsman (who are also easy to locate right now) are described with some pointers on how to find them in the index listed in this recent post. The monthly declining cycle of the moon was seen as having deep spiritual significance, and was incorporated into numerous extremely important and central myths in the world's ancient mythological systems. The insightful self-taught Egyptologist, mythologist, and poet Gerald Massey (1828 - 1907, whose work has been discussed in numerous previous posts including this one and this one) expounded at length upon the mythological manifestations of the lunar cycles and their possible spiritual meanings in Luniolatry, Ancient and Modern (1887). There, he demonstrates that the monthly pattern of the moon's decline and eventual disappearance, followed by its "rebirth" immediately after the time of new moon in the potent upward-horned crescent of the young moon which grows thicker and stronger on each successive night all the way up to the point of full moon (where the cycle of decline begins again) was behind many myth patterns, but one of the most widespread included the wrestling or contending of two "brother-figures," one dark and one light, with the darker one eventually proving to be at least temporarily victorious. Massey demonstrates that, although Osiris is also a solar god (the sun in the underworld, who is reborn triumphantly as Horus at the eastern horizon), he also has strong lunar elements in his myth, and his murder by his brother Set (or Seth) is a clear manifestation of the lunar cycle. Part of the evidence that Massey offers in support of this interpretation is the fact that Plutarch tells us in his version of the Egyptian myth (in which Plutarch calls Set by his Greek name, Typhon), Set is hunting by moonlight when he comes across the corpse of Osiris, and he subsequently dismembers the body of Osiris by cutting it into fourteen pieces and scattering them abroad in order to try to prevent his brother's revivification. Another fable of the dark half of the lunation has been preserved by Plutarch, who relates that when Typhon, the evil power, was hunting by moonlight, he by chance came upon the dead body or mummy of Osiris prepared for burial, and, knowing it again, he tore it into fourteen parts, and scattered them all about. These fourteen parts typify the fourteen days of the lessening light, during which the devil of darkness had the upper hand. The twenty-eight days made one lunar month according to Egyptian reckoning. 8. Isis, who in some aspects of the myth is herself associated with the full moon, re-assembles the fourteen pieces, although (as Plutarch tells us but Massey does not mention) she is never able to find one important piece, perhaps representative of the fact that the new moon is invisible (unlike the other "slices" of the moon on the days in which it is declining down towards the point of new moon). And yet it is out of the invisible new moon that the young and powerful waxing moon will be born, growing in power until he avenges his father's death (see the myth of Horus, as well as Hamlet). Plutarch's important text discussing the myth-cycle of Osiris, Set, Isis and Horus can be found online here. Massey goes on to demonstrate that the struggle between the forces of light and darkness in the cycle of the moon is almost certainly fundamental to the myths of Cain and Abel, Jacob and Esau, Krishna and Balarama, and many other world-myths of twin brothers who fight against one another (and in which the one representing the power of darkness is seen to prevail, at least for a time). These stories in the world's ancient scriptures of brothers killing brothers, such as Cain and Abel, would be horrible and depressing, if they represented literal events (and, tragically, battles pitting brother against brother are in fact part of the human experience), but the evidence compiled by Massey and other researchers, showing the clear repetition of the lunar pattern in myth after myth from around the world, strongly argues that these myths, at least, were not intended to be understood as describing earthly events, but rather heavenly ones. However, as intimated by the quotation from Alvin Boyd Kuhn included in the previously-linked discussion of the phenomenon of the new moon, these heavenly motions were seen as conveying and embodying powerful truths about our own human condition, here in our earthbound incarnated state ("as above, so below"). The moon's monthly cycle of decline and then eventual rebirth, according to Alvin Boyd Kuhn, imparted to us the same message that the nightly, yearly, and even "Great-Yearly" motion which all the stars, planets, and faraway constellations also impart: the truth that we come down to this human existence from a higher, fiery, spiritual plane, here to toil for a time in what is, relatively speaking, an underworld, but that there is something miraculous in this cycle, and that out of the hidden new moon (when light seems swallowed up by darkness) the triumphant new Horus always ascends again in the lunar cycle, repeated before our eyes each month (if we are paying attention). The date of Chinese New Year is determined by the new moon, but also by the winter solstice. Thus, it is a solar and lunar New Year, as explained in this helpful article. For discussions of the phases of the moon, and the cause of the new moon, see discussions in previous posts, such as this one and this one. The above video was stitched together from NASA images, and shows the phases of the moon as well as the phenomenon of lunar libration. As it orbits the earth, the moon presents the same face towards us at all times, but even as it does so it rocks slightly in a motion which is called "libration," and which can be seen in the video sequence. After pondering the beautiful motion of the earth and the moon around their common "barycenter," you will undoubtedly develop a greater appreciation for the fact that the Chinese New Year takes into account both the sun and the moon in relation to the earth! In Lost Light (discussed in this previous post), Alvin Boyd Kuhn put forth the thesis that the motions of the sun, moon, and other celestial bodies were seen by the ancients -- all over the world -- as typifying the descent of the human soul into incarnation in this life, and its re-ascent to the world of spirit, through the cycles of incarnation and re-incarnation by which, as he paraphrases the Egyptian Book of the Dead, "the soul steppeth onward through eternity"(41). Millions of intelligent persons today have looked upon sun and moon throughout the whole of their lives and have never yet discerned in their movements and phases an iota of the astonishing spiritual drama which the two heavenly bodies enact each month, a drama disclosed to our own astonished comprehension only by the books of ancient Egypt. 71. But now that you know, you can contemplate this profound subject in the majestic cycles of the sun, moon, and stars, including in the cycles which bring about the annual Chinese New Year. Happy Chinese New Year! Wishing you all peace, health, freedom, and consciousness in the New Year. Conditions turned out to be just right for viewing the very young crescent moon in my neighborhood of the globe last evening. As the sun sank below the horizon, the brilliant planets Venus and Jupiter looked like jewels in the deepening blue high above, forming a line which pointed down towards the red glow where the sun had disappeared over the rim of the earth's horizon. At first, the very fine sliver of the moon's arc was impossible to spot, but suddenly it was unmistakeable. The photograph above does not do it justice at all. Through binoculars it was breathtaking -- a thin silvery line, so thin that it was not even completely continuous. There is a gorgeous photograph on the web taken by photographer Stephano de Rosa which shows the same crescent over the Alps: this is very much what it looked like here, except that the color of the sky was different over the Pacific Ocean. Clicking on that photograph enlarges it for even better detail. Just below and to the left, Mercury could be easily spotted through binoculars, a very small jewel sitting in a golden sea of the sun's glow (at first). As the rim of the earth continued to "rise up" (or the sun continued to retreat further below the horizon), this glow diminished and the moon and the planet Mercury became very distinct in the darker blue background. Mercury took on a very slight orange hue (almost yellow-orange). This previous post outlined some of the mythological connections associated with the category of planetary events we are enjoying this month. The excellent video from Sky & Telescope's Tony Flanders shows where the crescent moon will be located tonight. As the sun continues to outpace the moon like a runner in a race that has passed another runner and continues to widen the gap, the moon trails the sun by a greater distance each day, and thus sits higher in the sky after sunset each evening. The crescent also thickens as the moon gets further from the sun (on its way to becoming full when the moon has gotten so far from the sun that it is now opposite to the sun from the observer on earth -- see previous discussions here and here). Mr. Flanders also has an accompanying article which explains that last night's very thin crescent moon was about twenty-eight hours old when the sun was going down on the west coast of North America on the evening of February 22 (about twenty-four hours old for viewers along the east coast of the same continent). A link in that article takes you to another excellent Sky & Telescope discussion of very new crescent moons. It explains that the window of sixteen to twenty-four hours after the precise moment of new moon is about the soonest one can observe the very thin crescent with the naked eye. The record for naked-eye observation of a new crescent is currently a moon that was only fifteen hours and thirty-two minutes old. 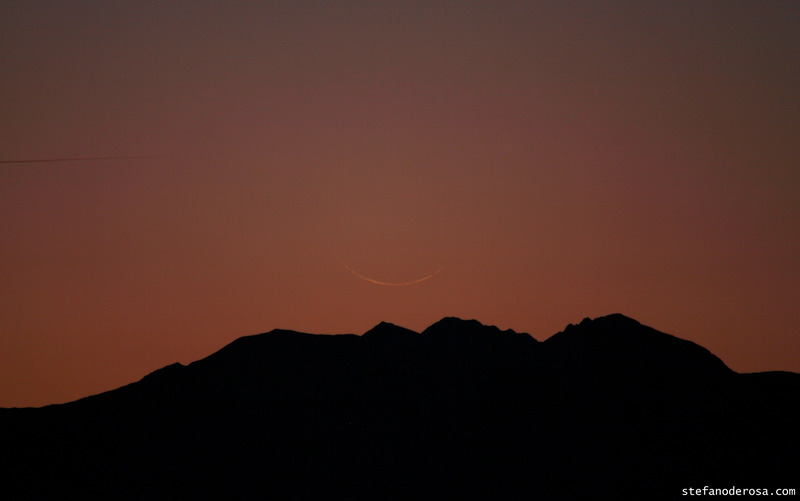 A crescent only eleven hours and forty-two minutes old was observed with optical aid in 2002. The second page of that article on observing very new crescents explains that astronomers have determined that the moon must be at least seven and a half degrees behind the sun for a crescent to begin to appear at all. Some of the work in this area was done by professor of astronomy Dr. Bradley Schaefer, who is mentioned in that article and also in this previous post discussing his important new analysis of the star catalogs of Ptolemy and Hipparchus (and his analysis of the Farnese Globe). All five visible planets are now observable in the same evening. The planet Saturn rises later in the constellation Virgo, which follows Leo and retrograde Mars in the east. The Chinese New Year is the most important celebration of the entire annual calendar in the traditional Chinese year. Chinese New Year begins with the second New Moon after the Winter Solstice. Since there was a New Moon on December 24, 2011 (which waxed into a Full Moon on January 9th and has since been waning), the New Moon which commences on January 23rd is the second New Moon since the solstice and ushers in the Chinese New Year. For some discussion about the phases of the moon and the celestial mechanics behind these phases, see this previous post and this previous post. For more on the celestial mechanics behind the recent Winter Solstice, see this post and this post. This year, the calendar of Taoist astrology says that we are entering the Year of the Dragon (which occurs once every twelve years). Taoist astrology also assigns one of the five Taoist elements (or "energy phases") to each year -- the five energy phases are wood, fire, earth, metal and water. There are actually "wood dragon" years, "fire dragon" years, "earth dragon" years, "metal dragon" years, and "water dragon" years: the combination of the twelve animals plus the five energy phases creates a sixty-year cycle rather than a simple twelve-year cycle. This year will be a "water dragon" year -- the last such year in the cycle was sixty years ago, in 1952. Note the association of the Dragon with earthquakes -- this may be very significant. The hydroplate theory draws a scientific connection between powerful earthquakes and plasma discharge (see again the blog post linked above discussing the importance of piezoelectricity in the origin of radioactive isotopes and in the ongoing electric effects present around very powerful earthquakes even into the modern era). David Talbott argues that the celestial serpent embodies powerful plasma discharge: we have already seen that the ancient Chinese associated this same dragon with earthquakes. Further confirmation is given in the video linked above of Feng Shui master Raymond Lo, associating the dragon with earthquakes. Thus, the dragon's connection with both earthquakes and powerful electric discharge (or even plasma discharge) appears to resonate with the connections made between these phenomena by the hydroplate theory (for more on the connection of plasma discharge and earthquakes, both in the cataclysmic flood event and in very powerful earthquakes in the modern era, see this section in Walt Brown's online book). We can only hope that this year will not see any catastrophic loss of life or property from powerful earthquakes or electric discharge. However, the apparent connection between the two phenomena embodied in the dragon is an important clue about the ancient history of mankind, and an important confirmatory detail that supports the hydroplate theory. Happy New Year to all and very best wishes for a prosperous Year of the Dragon! Gung Hay Fat Choy!